The collapse of the Somali National Army (SNA) in Balcad (30 kilometers) North of the capital Mogadishu and previous collapse a few days earlier in Dhanaane (15 kilometers)South of Mogadishu International Airport, is nothing short of a monumental disaster for President Mohamed Abdullahi Farmaajo and Prime Minister Hassan Ali Kheyre. Desperate and destitute SNA units abandoned their posts because they were not paid for three to five months, and many soldiers have reached a breaking point, according to Somali officials. This was a second time in two-week soldiers left posts. Soldiers based in Mogadishu went on strike last week after not receiving their salary for over three months and running out of food, and fuel, according to reports. The missing funds allocated for the soldiers is said to be funneled to payoff the parliament to end motions for impeachments and also cover Farmaajo, Khyre and Fahad’s lavish lifestyle. As result, Al-Shabaab have rapidly advanced and they are now within a distance of re-capturing areas in and around the capital, Mogadishu. The International Community spent millions of hard currency training, the Somali National Army (SNA), arming and equipping unraveled due to Farmaajo and Kheyre’s incompetence, micromanagement, mismanagement, abuse and corruption. Al-Shabaab have regained many towns and villages SNA and the African Union Mission in Somalia (AMISOM), fought and sacrificed to liberate, seizing areas in Lower and Middle Shabelle. Although Al-Shabaab has been resurging for months, no one predicted the speed of collapse in Mogadishu, Balcad and Dhanaane. Kheyre who in a hastily organized and staged press conference falsely claimed his government had paid salaries and have funds to support SNA, blaming failures to pay soldiers on biometric registration and technical issues. Kheyre was incredibly disingenuous, according to Somali Security Officials who routinely interacted with him and are familiar with the poor state of the SNA. Reports from Villa Somalia suggest Farmaajo held emergency meeting desperately seeking support to cover SNA pay. Many are also blaming Abdisaid Ali, the National Security Adviser and Samira Giad, Prime Minister Kheyre’s senior security adviser. Neither Abdisaid nor Samira have the background or education to manage complex security institutions, leading to collapsing security, hungry and desperate soldiers and their families that are in mutiny inside military barracks in Mogadishu, and across the country. According to sources, Fahad Yasin appointed Abdisaid Ali over more qualified and capable security professionals. Abdisaid who calls himself Super Minister has been a polarizing and vindictive, alienating many in the government institutions, such as the Ministry of Foreign Affairs, Ministry of Defense, Ministry of Finance, Ministry of Security, NISA, and SNA, leading to daily clashes with ministers as well as senior military commanders including Chief of Defense Forces. Abdisaid, who many call “Incompetent, ignorant, and Arrogant”, is a prolific immature social media user, routinely clashing international community, foreign diplomats, and journalists on Twitter and Facebook. Farmaajo’s decision to appoint Abdisaid will go down as another monumental disaster, leading to collapse of the security forces, and Al-Shabaab’s resurgence. Farmaajo, a former mid-level City of Buffalo employee, who has no leadership qualities, military, and security experience and whose greatest achievement before he was elected was propagating a narrative that he paid salary of security forces. Farmaajo called for paying salaries, but never successfully implemented it and the problem of unpaid SNA salaries continue to persist to date. What many remember from his time, as Prime Minister is how he made then government of Sheikh Sharif erratic and unstable, leading to perpetual conflicts with governments, and the International Community, leading his un-ceremonial dismissal. Kheyre a former Norwegian Refugee Council (NRC) staff surrounded himself with family and friends, as well as former NGO colleagues with no experience to lead sensitive military, and security portfolios, leading to corrupting security sector. 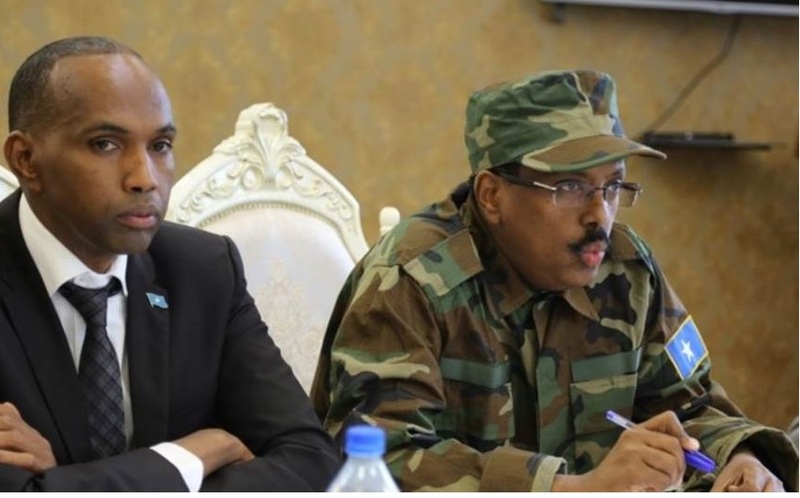 Senior officials with decades of military experience were dismissed by Kheyre and replaced with incompetent “Yes Men”, leading to clashes with SNA, and other security forces. Kheyre a narcissist with limited government experience is alleged to only values the opinion of “White People, European’s and American’s, seeing them to be superior to Somalis”, said senior Villa Somalia official. “He hates seeing any Somali who knows better or is intellectually superior to him,”said anther Villa Somalia official, dismissing competent staff, while shutting door to experienced technocrats who sit idly at Coffee’s in Mogadishu and Nairobi waiting to be called back to service. Among them are many senior officers and technocrats trained in Somalia, Europe, and United States who returned and volunteered to rejoin security forces. Some waited for months in Mogadishu, while others frustrated by the long wait returned to their lives in the west dejected. At a time when the federal government and specially security forces need experience and capable technocrats, Kheyre treatment of them and reliance on junior NGO officers to lead security sector has been indicative of his mismanagement of the affairs of the nation. Why Somali Army Units Collapsed? SNA units are collapsing because they have not been paid for over 3 months. The units have not received food and life support for months, reaching a breaking point, according to commanders. Reports suggest Kheyre has been using biometric registration to cover for failure to pay and other benefits on time. The collapse is also due to Farmaajo and Kheyre embezzled SNA funds and using it to payoff the parliament to end motions to impeach them. The funds were also used by Farmaajo and Kheyre who according to reports traveled more in their first two years than Hassan Sheikh did in four years, to finance unnecessary and expensive travel on private chartered jets, costing taxpayers and international community donors millions over the past two years. Unlike Farmaajo and Kheyre, Hassan and his government rarely traveled on private jets, using regular commercial flights, via Nairobi or Istanbul. One of such trip was Farmaajo’s trip to resort town of Sharm El-Sheikh, Egypt to attend EU – Middle East Summit, costing more than $150,000.00. Many governments sent foreign ministers or junior ministers. Kheyre departed for Switzerland on a private jet chartered from Turkey the morning after Al-Shabaab attacked Maka Al Mukarama hotel, while the smoke and fire were still visible and before the victims of the attack were buried to attend UN Conference spending more than $250,000.00, according officials. With federal government funds abused, mismanaged, and wasted by Farmajo and Kheyre, Soldiers and their families are left without their salaries and are going hungry. The pair are now frantically seeking support from the Gulf States they alienated, sending delegations to Saudi Arabia, and Kuwait, after Qatar only provided $20 million for the year and reduced support to Somalia. In the coming weeks, Kheyre is expected to travel to the United States to attend the International Monetary Fund (IMF) and World Bank (WB) event in Washington, DC. The event is annual gathering of IMF and World Bank officials to discuss global economic and financial issues and governments participate in the events. Governments normally send their Ministers of Finance or Central Bank presidents to lead their delegation. Kheyre who has no background or experience in economy or global finance is expected to lead the Somali delegation, spending limited financial resources on lavish and unnecessary travel, while soldiers and other government employees go without a pay for months and their families go hungry. After two years we are seeing the full picture of Farmaajo and Kheyre. This is “Nabad iyo Nolol” Farmaajo and Kheyre style. They have Nabad “Protected inside Villa Somalia, and Nolol, living lavishly like kings and traveling to exotic cities and resorts at the expense of soldiers, their families, and average citizens”. What is heartbreaking is that unpaid soldiers and hungry protect their families, houses, offices, ministers and senior staff. With the exception of die-hard “Nabad iyo Nolol” sicko-fans, tribalist, and paid media and online trolls, many in Somalia have soured on “Nabad iyo Nolol” (Peace and Life) government, seeing them for who they truly are “incompetent and corrupt”. They neither have brought Somalia peace or life. Farmaajo and Kheyre are impostures. They continue to play on fragile, and desperate desire by many for security and stability to distract, abuse and misuse the nation, corrupting the parliament to abdicate their constitutional responsibilities. Many in the Parliament “Golaha Shacabka” are corrupt, sitting in coffee shops in Nairobi and Dubai collecting salary and monthly “Nabad iyo Nolol” bribes, abandoning their voice, morals, integrity, and honor, becoming known in Somalia as “Golaha Sacabka”. Dr. Ibrahim is former senior United Nations official who served in the Africa, the Middle East and the United Nations Head Quarters in New York. Dr. Ibrahim is a security and development consultant as well as freelance writer based in Nairobi, Kenya. – The disintegration of the Federal GovernmentBy Gulet H.